Garuda Indonesia budget subsidiary Citilink is planning more rapid domestic expansion in 2014 and the launch of international services, with an initial six routes. The expansion comes despite challenging market conditions in Indonesia and continued losses, including a net loss of USD48 million for 2013. But Citilink is striving to reduce its costs and improve its profitability by increasing utilisation levels and average stage lengths. Longer domestic routes and the launch of international services will drive up utilisation rates on its fleet of A320s, which is expanding from 24 to 32 aircraft in 2014. International services will also provide an important new foreign currency revenue stream, cushioning the impact from the rapid depreciation of the Indonesian rupiah. Citilink aims to launch services to four international destinations in 2014. The carrier has selected Johor Bahru in Malaysia as its first destination overseas, followed by Kuala Lumpur, Singapore and eventually Perth. Citilink currently operates 136 daily flights across a network of over 20 domestic destinations using a fleet of 24 180-seat A320s. The carrier plans to add 44 daily flights in 2014 as it takes delivery of eight additional A320s, ending the year with 180 daily flights and 32 aircraft. Citilink’s 2014 expansion plan includes six international routes. The carrier recently began ticket sales and set a 15-Mar-2014 launch date for its first international route, a daily service from Surabaya to Johor Bahru in southern Malaysia. Citilink CEO Arif Wibowo tells CAPA that the carrier has five other international routes in its 2014 plan – Surabaya to Kuala Lumpur and Singapore along with Bali to Kuala Lumpur, Singapore and Perth. Citilink has not yet set launch dates for Kuala Lumpur, Singapore or Perth but Perth is expected to be the last of its new international destinations as the process of securing approval from Australian authorities is longer than from Malaysian or Singaporean authorities. Citilink has already secured approval from Indonesian authorities to begin operating international services. Citilink will compete against Indonesia AirAsia on its first international route, Surabaya-Johor Bahru. Indonesia AirAsia launched services to Johor’s Senai Airport in Oct-2012, initially serving Surabaya. The Johor-Indonesia market, which caters mainly to migrant workers, has been highly successful for Indonesia AirAsia, leading the carrier to add services to Johor from Jakarta and Bandung and now also attracting Citilink. Indonesia AirAsia now serves Johor Bahru with a daily flight from Surabaya along with four weekly flights from Jakarta (added in May-2013) and four weekly flights from Bandung (added in Dec-2013). The carrier’s 15 weekly flights in the Johor Bahru-Indonesia market will give it a 68% share of seat capacity compared to 32% for Citilink. In the Johor Bahru-Surabaya market each carrier will have a 50% share after Citilink launches its daily service on 15-Mar-2014. Indonesia is the only international destination currently served from Johor Bahru, which is located across from Singapore. Malaysia AirAsia is already the leading domestic carrier at Johor, operating six routes (Kuala Lumpur, Kota Kinabalu, Kuching, Miri, Penang and Sibu; with Tawau to be added in Apr-2014) and accounting for about two-thirds of total domestic capacity. Citilink will be only the sixth carrier operating scheduled services to Johor Bahru, joining Indonesia AirAsia, Malaysia AirAsia, Malindo Air, Malaysia Airlines and MAS regional subsidiary Firefly (South Korea’s Asiana also operates seasonal charter services to Johor). AirAsia is the only airline group currently linking Johor with destinations other than Kuala Lumpur, giving it a strong position in the market. Citilink could face some challenges in the market as its brand is an unknown in Malaysia. Unlike all its other initial international routes Citilink is also unable to leverage its parent Garuda in the Johor market. Citilink also will have to overcome stiff competition from AirAsia on all five of its other planned international routes. But Citilink at least will be able to leverage Garuda’s position in the Kuala Lumpur, Singapore and Perth markets. Unlike in the Indonesian domestic market, where the two brands operate side by side, the Garuda group strategy for international routes envisions the two brands operating different sectors. This will likely result in Garuda dropping its own services on the Singapore-Bali, Singapore-Surabaya and Perth-Bali routes as Citilink enters these markets. Citilink is potentially the most suitable brand for these routes as they connect secondary cities in Indonesia rather than the capital Jakarta, where Garuda has most of its international operation, and are primarily leisure or migrant worker rather than business markets. Surabaya-Singapore and Bali-Singapore are highly competitive markets with significant LCC competition. Surabaya-Singapore has particularly become a challenging market as total capacity has doubled since the beginning of 2013. Five carriers have launched services on the route since late 2012 – Tigerair Mandala, Tigerair Singapore, Singapore Airlines, Indonesia AirAsia and Garuda. The Tigerair Group is currently looking at reducing or dropping its 13 weekly flights between Surabaya and Singapore as it sees overcapacity in the market. Surabaya-Singapore is also served by Jetstar Asia subsidiary Valuair with 10 weekly flights, Indonesia AirAsia with seven weekly flights, Lion Air with seven weekly flights, China Airlines with seven weekly flights and Singapore Airlines/SilkAir with 14 weekly flights (seven each), according to OAG data. Bali-Singapore has generally been performing better but will be challenging for Citilink as it is almost entirely an inbound market. Lion previously dropped services on Bali-Singapore and Citilink could face a similar battle as it also has a predominately local brand. Indonesia AirAsia, which benefits from leveraging the much more internationally recognised AirAsia brand, currently operates four daily flights between Singapore and Bali. SIA also operates four daily flights while Jetstar/Valuair operate two daily flights and Tigerair Singapore/Tigerair Mandala operate 19 weekly flights (soon increasing to 26). Qatar Airways and KLM also operate daily services from Singapore to Bali as part of tag flights with local pick-up rights. Bali-Perth is also a highly competitive market dominated by LCCs and consisting almost entirely of inbound leisure passengers to Bali. From the full-service sector Garuda currently has 10 weekly flights on the route and Virgin Australia has nine weekly frequencies. 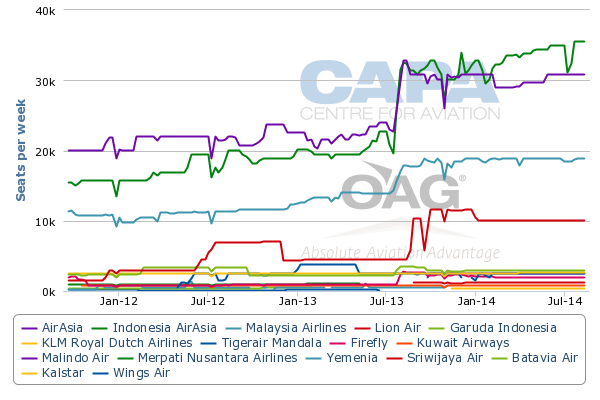 Indonesia AirAsia is the market leader with 32 weekly flights and Jetstar has 17 weekly flights, according to OAG data. 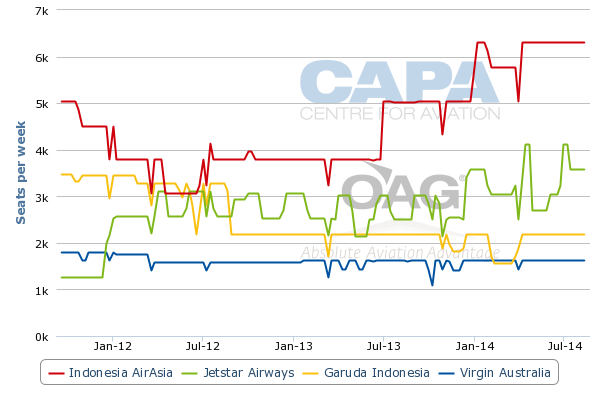 Assuming Citilink takes over the Garuda flights, Virgin Australia will be left as the only full-service operator. Even the Virgin Australia flights will likely be shifted to sister carrier Tigerair Australia over the medium to long term (once Tigerair Australia is ready to enter the international market). Kuala Lumpur is a slightly different market as Garuda currently only serves the Malaysian capital from Jakarta. In this case the Citilink brand will be used to enter two relatively large routes that the Garuda Group has not yet penetrated. AirAsia is the dominant brand in both the Surabaya-Kuala Lumpur and Bali-Kuala Lumpur markets. AirAsia (including Malaysia AirAsia and Indonesia AirAsia) offers five daily flights on Surabaya-Kuala Lumpur and six daily flights on Bali-Kuala Lumpur. Tigerair Mandala had been the only other carrier currently serving Surabaya-Kuala Lumpur but recently dropped the route as part of its network restructuring, leaving an opening for Citilink. On the bigger and more competitive Bali-Kuala Lumpur route, AirAsia currently competes against Malaysia Airlines and Malindo. MAS operates four daily flights to Bali, including two with widebodies, while Malindo operates just one. In the Indonesia-Malaysia market overall, the AirAsia Group accounts for about 60% of total capacity compared to 18% for MAS, 12% for the Lion Group (includes Malindo) and only 3% for Garuda. Citilink’s upcoming entry into Johor Bahru and Kuala Lumpur will allow Garuda to increase its share of the Indonesia-Malaysia market to a more meaningful 7%. If its initial three Malaysia routes prove successful, Citilink will likely pursue further expansion in Malaysia. Expanding into the international market is a significant step for Citilink given the intense competition and challenging conditions in the domestic market. As CAPA previously reported in the first two instalments in this series of analysis reports on the Indonesian budget carrier sector, the sudden devaluation of the rupiah in 2H2013 has impacted profitability and led some carriers to cut back in the domestic market. While domestic fares are now starting to inch up, airlines have not yet been able to fully offset the 26% drop in the rupiah against the USD from 2013, which led to about a 20% increase in costs as most airline costs are fixed in USD. Indonesia AirAsia (IAA) is increasing its focus on the international market in 2014 as it reduces its domestic operation. IAA is already the largest Indonesian international carrier while having only a small presence in the domestic market. Indonesia AirAsia overall is a similar size to Citilink, operating a fleet of 30 A320s. Indonesia AirAsia now allocates about 60% of its capacity to the international market, a figure which it expects to increase to 70% in 2014 as it slows overall expansion. Smaller Tigerair Mandala also has deferred fleet expansion and has temporarily reduced utilisation levels of its nine-aircraft A320 fleet. The carrier is also relatively international focused, with a 73%/27% seat capacity split in favour of the international market as of Mar-2014 (once its network restructuring exercise is complete). 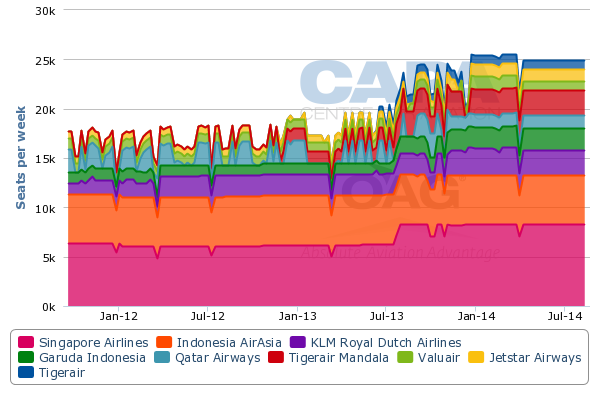 See related report: Tigerair Mandala slashes capacity and aircraft utilisation levels. Will other Asian LCCs follow? Lion currently only serves eight international routes and four countries – Singapore, Malaysia, Vietnam and Saudi Arabia (the latter is served with Lion’s niche fleet of two 747-400s). Lion also is keen to enter the Australia market but has not yet made a move, realising it may be difficult to secure approval from Australia’s Civil Aviation Safety Authority (CASA). Lion is striving to improve its operation before applying for CASA approval to serve Australia from Indonesia – and potentially the domestic Australian market, which remains a medium to long-term ambition for the fast-expanding group. While Citilink will have to meet the same strict standards of CASA the carrier has the benefit of support from parent Garuda, which has served Australia for decades and has a growing operation to Australia. At just under four hours Bali-Perth will be by far Citilink’s longest route, helping the carrier in its quest to increase its average utilisation rate and stage length. Citilink’s average flight is currently only 90mins and it does not have any flights over two and a half hours, according to OAG data. Citilink sees its shorter stage lengths and relatively low utilisation rates as responsible for its higher cost base compared to other Indonesian LCCs. Indonesia AirAsia’s average flight is two hours and the carrier currently utilises its A320s on average of 13 hours per day, a rate it plans to maintain in 2014. Citilink’s average stage length is projected to increase from 789km in 2013 to 837km in 2014, according to Mr Arif. Aircraft utilisation will increase at an even faster clip, from a full-year average of 7hr23mins in 2013 to 9hr30mins in 2014. Citilink has already been working over the last three months to increase utilisation by squeezing more flights out of its current fleet of 24 A320s. Monthly utilisation rates have increased from 7hr13min in Nov-2013 to 8hr10min in Dec-2013 and 8h47min in Jan-2014, according to Mr Arif. The utilisation rate is expected to further inch up as Citilink uses its existing fleet to add another 12 daily flights (for a total of 148 compared to 136 currently) by Apr-2014. Citilink is not expected to take its 25th A320 until Jun-2014. Mr Arif says Citilink is slated to take seven of its eight additional aircraft for 2014 in the second half, including two in July and one per month from August through December. 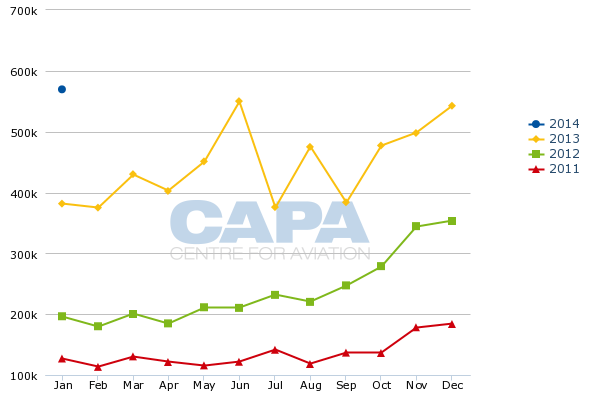 The gradual increase in utilisation since December follows a period in which Citilink was under-utilising its aircraft because of a lack of slots. For much of 2013 Citilink was forced to park some aircraft during certain periods as it struggled to secure additional slots at its main bases. 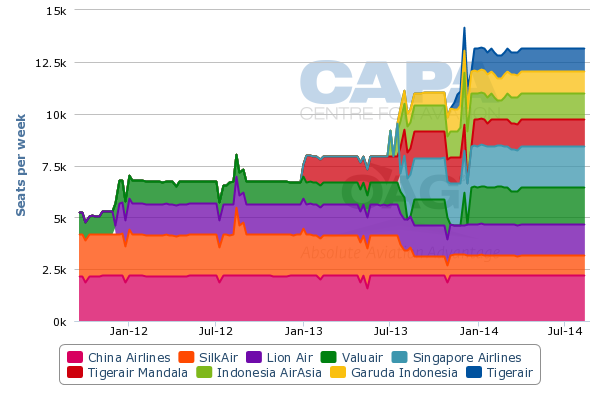 Citilink has been able to secure more slots in recent months. The opening of secondary Jakarta airport Halim particularly helped. Citilink began operations at Halim on 10-Jan-2014 and currently operates 16 daily flights at the airport. Mr Arif says the carrier now bases two A320s at Halim with an average utilisation rate of 11 hours. Citilink was also able to take over several slots and domestic routes from Batavia after Batavia ceased operations in early 2013. Citilink recently applied to take over routes and slots from Merpati, which suspended operations in Jan-2014. While Merpati primarily operated small regional routes which Citilink is not interested in serving, Merpati also served a few trunk routes. Citilink is particularly interested in taking over some Merpati routes from Makassar and Jayapura. Citilink has been expanding at Makassar, resuming several routes from the central Indonesian city in late 2013 after Indonesia AirAsia shut its Makassar base. Citilink is now aiming to further extend its network to the east, including to Jayapura in the far eastern province of Papua. As eastern Indonesia is isolated (about five hours from Jakarta and three from Makassar), new routes to the east will help boost Citilink's average stage length and aircraft utilisation rates. Demand for services from eastern Indonesia are also growing rapidly, driven by a strong local economy. But most of eastern Indonesia is not currently served by any LCCs except Lion. While Citilink is keen to develop an international operation, which Mr Arif expects will eventually account for 20% of its international capacity, domestic expansion remains the main near-term priority. Citilink remains optimistic about the prospects of the domestic market despite the recent challenges. Mr Arif says the carrier’s domestic fares are on the rise, reaching USD54 in Jan-2014. Citilink’s average fare for the full year in 2013 was USD46. The increase in fares is an encouraging sign as Indonesian carriers initially struggled to offset the rise in costs that came with the sudden depreciation of the rupiah given the intense competition in the domestic market. Efforts to improve load factor have also been succeeding, giving Citilink confidence that it can improve its financial performance. Citilink reported an average load factor of 78.7% for Jan-2014, a 6.3ppt improvement compared to Jan-2013. 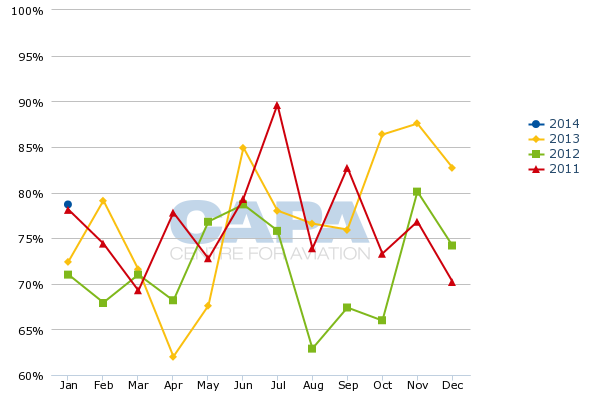 The carrier’s load factor has now been tracking higher for eight consecutive months. For the full year in 2013, Citilink’s load factor was up 5.3ppt to 77%. The carrier was able to outstrip a 75% increase in ASKs by growing RPKs by 88%. But Citilink struggled in 2013 with an operating loss of USD60 million and net loss of USD48 million. Revenues were USD273 million, resulting in an operating margin of negative 22%. Year-over-year comparison figures are not available as Citilink was only spun off as a separate subsidiary in Jul-2012. The carrier, which previously operated as a unit under Garuda, incurred a net loss USD28 million in the first six months of operating under its own AOC (2H2012) with revenues of USD73 million. As a result Citilink has incurred losses of USD76 million in the first 18 months since it was spun off. Garuda has long-term ambitions to pursue an initial public offering at Citilink and short-term ambitions to sell a 40% stake to a strategic investor. Garuda is now entertaining offers from interested strategic investors and aims to close on a deal in mid-2014, potentially with a foreign airline group. But any sale could end up being delayed until there is an improvement in market conditions and Citilink demonstrates an improvement in its financials. While Citilink has opportunities in both the domestic and international markets, competition continues to intensify. Taking on AirAsia across all of its planned international routes will be challenging while domestically the battle with market leader Lion will not get any easier. Citilink may be able to reduce its cost base as it increases utilisation rates and grows its operation, achieving greater economies of scale. But it is likely to continue having by far the highest cost base in the Indonesian LCC sector. Eventually a restructuring may be required in order to reach profitability. A tie-up with a foreign LCC group – in the form of a strategic partnership with an equity stake – could provide the impetus.